Calliope Games specializes in what they call “filler” games. These are games that you use to fill in time when you don’t want to, or don’t have time to, play a larger, longer game. I.E. – they’re games for your gaming backpack. 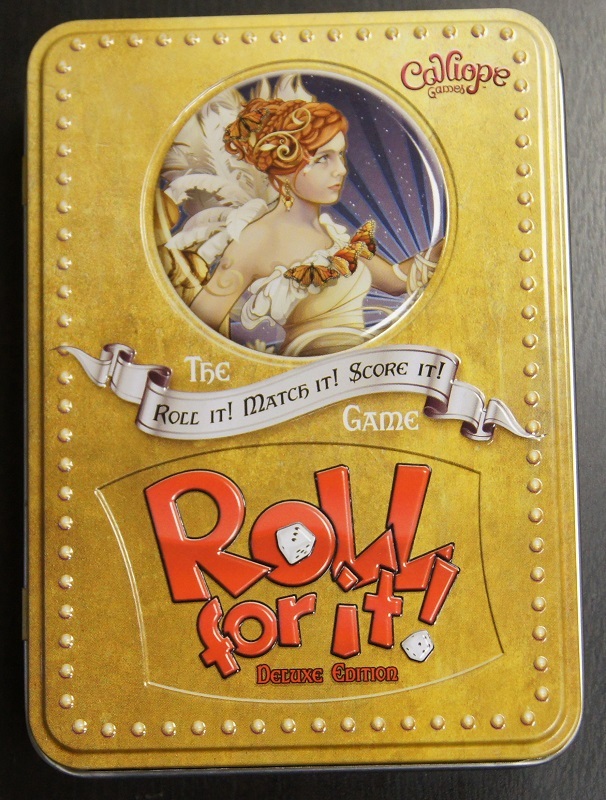 One of their main games is Roll for it! Well, they’re coming out with a Deluxe Edition and wanted me to let you know what I think about it. So they gave me a copy. Dice-rolling fiends wanted. 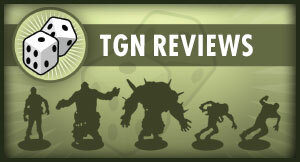 It’s time for another TGN Review. This time it’s Roll for it! In Roll for it!, players are trying to match their dice to the cards out in the middle of the playing area. The rules for the game are incredibly simple. In fact, there are only 4 and I’ve pretty much covered them in the first sentence there, but to give you a bit more of a look into things, the four steps to a player’s turn are: Return all your dice from cards back to your hand (Optional), roll your dice, match your dice to cards in the center, score cards. The main selling point of the Deluxe Edition is the packaging. The game comes in a rather nice tin that stores all of the other components. That includes a rulebook, two decks of cards (30 cards each. One’s silver-backed. The other is gold), and 48 dice (8 sets of 6 matching dice). There’s a very nice, embroidered, felt die bag. Finally, the tin also has a flocked, plastic inner tray. This turns the tin into more than just a containment vessel, but also a dice tray. No more worry about losing a die when rolling. Just roll in the tray and you’re safe. 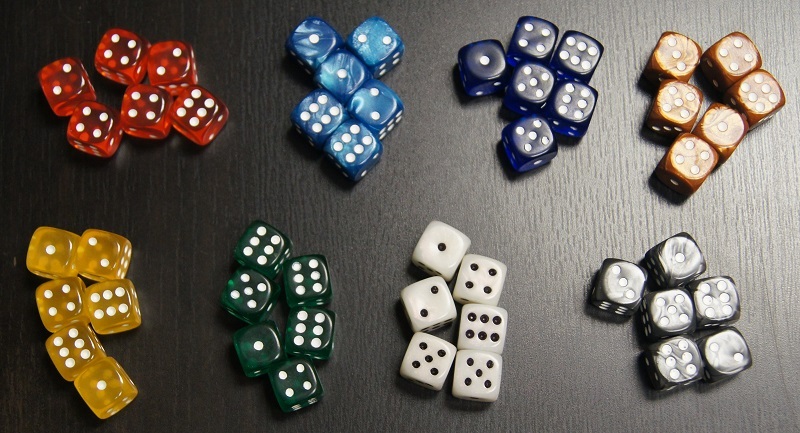 Game play begins with each player taking a set of 6 matching dice. If playing with just 2-4 players, you can pick either the gold or silver-backed cards. If you’re playing 4-8, shuffle both sets together. Place the deck where everyone can reach it. Then flip 3 cards face up into the center of the playing area. Roll off to see who goes first and you’re ready to play. The first thing a player may do at the start of their turn is take back all of the dice they have assigned to cards. Obviously on your first turn you won’t have any dice out there, but on subsequent turns, if you don’t like how things have been rolling, you can take all your dice back and start fresh. After that, you roll your dice you have. No rerolls allowed. 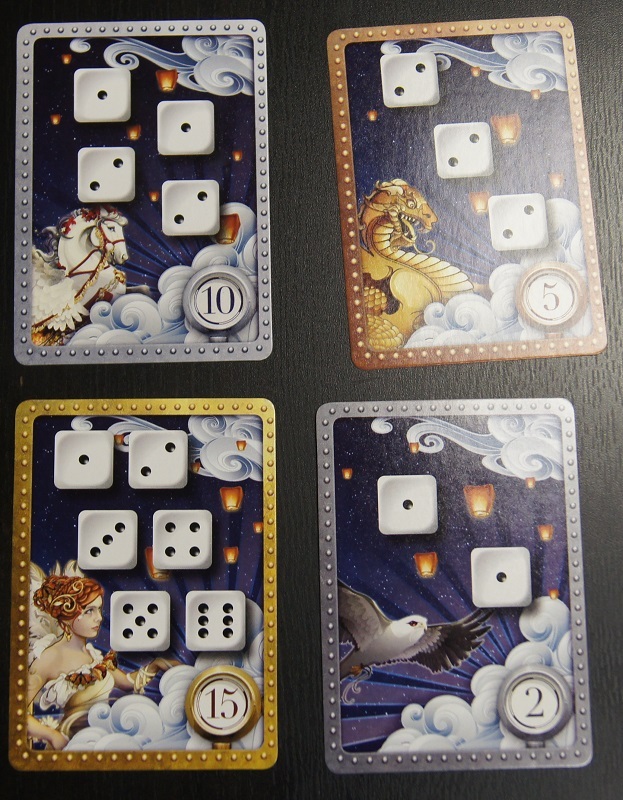 Looking over your dice, you can then match them to any of the cards out on the table. A die can only be matched to one card at a time. So, for example, if there are two cards with 3s on them, and you roll a 3, you can only match that 3 to one other the other, not both. After matching dice to cards, if you have matched all the dice on a card, you score that card, removing it from the middle of the table and placing it in your scoring pile. Any dice that were matched to that card are returned to their owners. Flip over a new card from the deck and place it in the middle of the table with the others. If you match some, but not all, of the dice on a card, then those dice stay there until either you, or some other player, matches all of the dice. In this way, your available dice pool will always be changing as you and your opponents look to match cards out on the table. The cards have different scores on them depending on how many dice it takes to score them. 2-dice cards are worth 2 points. 3-dice cards are worth 5 points. 4-dice cards are worth 10 points. 6-dice cards are worth 15 points. The object of the game is to be the first player to score 40 points. 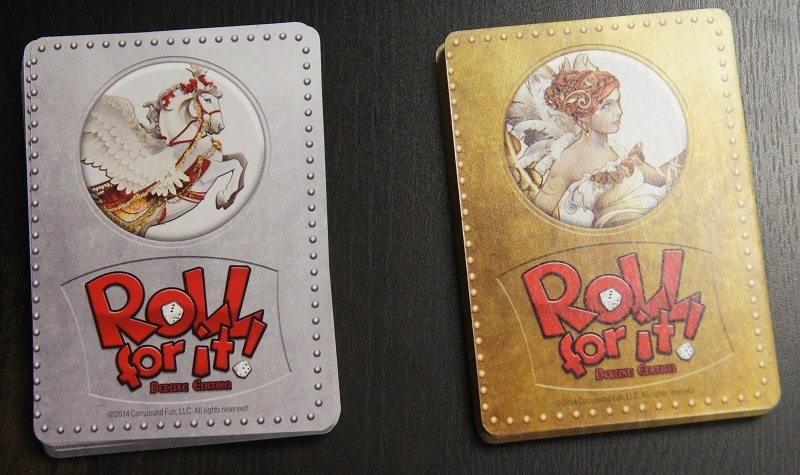 The selling points of the Deluxe edition of Roll for it are the card artwork, the dice bag, and the tin with the flocked tray insert. Do these really make the game something special? The cards are very nice. They have a good thickness to them and just enough gloss to make them shine, but not enough to make them slippery and hard to shuffle. The artwork is vibrant and colorful. The border of the scoring side is also color-coded to how many points the card is worth. Steel for 2 points. Copper for 5 points. Silver for 10 points. Gold for 15 points. It’s a small touch, but rather nice. The tin is good… but out of the selling points, it’s the one that’s got the tiniest of tweaks that could make it better. It could use to be about ¼ inch bigger all around. So if you removed the plastic tray, everything that goes inside would fit just about perfectly. But the tray, itself is a selling point, since it keeps the dice from clanking too loudly against the tin when you roll inside of it. To get everything to fit and the lid to close, you’d be best off putting the cards in the dice bag and having the dice in a single layer on the bottom of the tin. Even then, the lid will lift up slightly, but it will remain closed. The Deluxe Edition of Roll for it isn’t available yet, but will be soon. If you’re a fan of games like Yahtzee, you should check it out. I do like the single carrying case tin that the set comes in, though I might be concerned that it could open on its own if it were just bouncing around inside my gaming backpack. Calliope Games says they pride themselves on making “filler” game and they’ve done just that with Rool for it. The game can be set up, explained, and played in 15minutes, giving you plenty of time to play again, or simply be used between games of anything else. 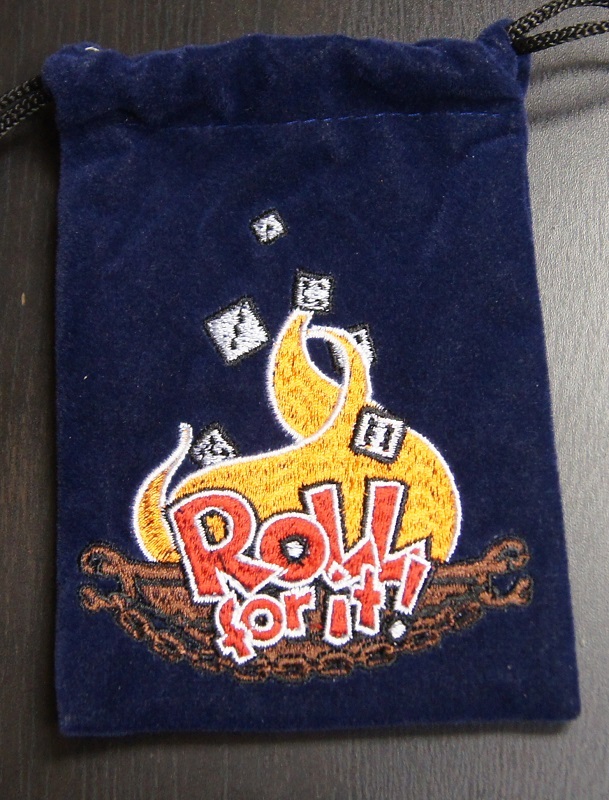 Keep your eyes out for Roll for it! deluxe edition, coming soon.